Today's top story, of course, has a Bronx, N.Y., dateline. We'll keep it short and sweet: Yea, Yankees! In other news, Simon & Schuster has begun offering e-galleys of forthcoming titles to booksellers, reviewers, media and others through Galley Grab, the e-galley program the company developed. Files can be read using the Adobe Digital Editions desktop reader, recent versions of the Sony Reader, B&N's nook and other devices. The files cannot be copied and expire on the book's pub date. "While we do not expect this to entirely replace physical galleys in the near future, Galley Grab is a convenient, cost-effective and environmentally friendly way to promote our upcoming titles and, not least, help us to expand the universe of those who can now have the chance to read our books before publication," said Ellie Hirschhorn, S&S's executive v-p and chief digital officer. Appropriately, the first title to be made available as an e-galley is the green title The Story of Stuff: How Our Obsession with Stuff Is Trashing the Planet, Our Communities, and Our Health--and A Vision for Change by Annie Leonard, which will be published by the Free Press in March. Glenn Beck, the conservative radio and cable show host, has had some 40 thriller writers on his shows during the past five years and has become, as Brad Thor put it, "our Oprah," the New York Times wrote. Guests have included David Baldacci, Nelson DeMille and James Patterson; some have views with which Beck disagrees. Still, in every case, Beck offers enthusiastic reviews of the titles. Seale Ballenger at Morrow told the paper that sales of The Doomsday Key by James Rollins were "totally driven by Glenn Beck"--Rollins appeared on his shows last summer. And David Brown at Atria observed, "I don't think there's anybody else on TV that is either that eager or open to booking novelists." Beck's radio show draws nine million listeners and his TV show has 2.7 million viewers. One sure thing about pricing wars is that every company involved gets hurt, writes James Surowiecki in the current issue of the New Yorker, dated November 9, in a Financial Page column on the book price wars. But this price war, despite the hooplah, is different because the point is to lure customers "online, away from big booksellers and other retailers, and then sell them other stuff. Usually, price wars wreak havoc because they erode the pricing power of an entire business. But, because this price war involves just ten items, its impact on revenue will be small, and outweighed by the positive effects of all the publicity." He concludes: "Outraged book publishers and booksellers are making exaggerated claims about how the discounts will devalue books and wreck the industry. But they're right about one thing. The real competition in this price war is not between Wal-Mart and Amazon but between those behemoths and everyone else--and the damage everyone else is incurring is deliberate, not collateral. Wal-Mart and Amazon have figured out how to fight a price war and win: make sure someone else takes the blows." In other continuing book price war coverage, the Charleston Daily Mail interviewed Ann Saville, owner of Taylor Books, Charleston, W.V., who "said that on top of the already slow economy anything that cuts into profits is 'obviously crippling.' The downtown bookstore has seen a 'tremendous decline' in the sale of national bestsellers because larger retailers are 'skimming off the cream,' Saville said. The store continues to do well selling literary fiction, children's books and up-and-coming authors, books that retailers with slim selections, such as Walmart and Kroger, don't carry." Referring to the letter sent by the ABA to the Department of Justice (Shelf Awareness, October 23, 2009) requesting an investigation of "predatory pricing practices," Tom Campbell, co-owner of Regulator Bookshop, Durham, N.C.--and one of the signers of the letter--said loss-leader pricing "has sent a message to people that books aren't really worth very much, that people have to discount books a lot to be able to sell them.... That's what we do is sell books, so if we sell them at a loss it's not a very good business model." Novelist Howard Jacobson selected his top 10 novels of sexual jealousy, those stories that "best anatomise the 'dark, interior stickiness' of a passion peculiarly well-suited to literature" for the Guardian. Spirit of the season: a group of book bloggers has founded "buy books for the holidays," a nonprofit project whose name says it all. The group will post essays "about why and how to buy books for the people on your gift list, shopping suggestion lists, information about reading charities and spotlights of independent bookstores." Indies can sign up through the site. Book trailer of the day: Beyond the Homestretch: What I've Learned from Saving Racehorses by Lynn Reardon (New World Library). For the first time, the Independent Booksellers of New York City is celebrating Independent Bookstore Week in the Big Apple, November 15-21, to highlight "the diverse cultural contributions made by indie bookshops across the five boroughs." The week will include author appearances, events, promotions and in-store displays at IBNYC's 60 member bookstores and begins with a party at powerHouse Arena that will feature author readings, refreshments, giveaways and live music. The week concludes on America Unchained Day. 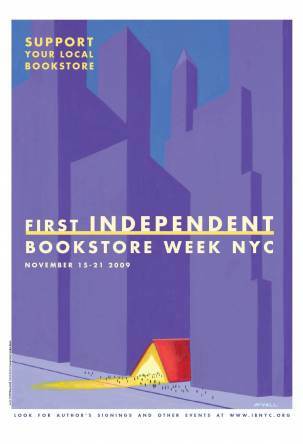 An Independent Bookstore Week poster (left) designed by New Yorker cartoonist Bruce McCall will be on display and for sale. The bookselling scene in New York City has shown relative strength in the past few years. Book Culture and Posman Books have expanded or are expanding, and new stores have opened, including Greenlight in Ft. Greene in Brooklyn, Idlewild in Manhattan, WORD in Greenpoint in Brooklyn and--soon--Boulevard Books in Brooklyn's Dyker Heights. Mitch Albom meets fans and signs copies of his new book, Have a Little Faith: A True Story (Hyperion), at a Costco in Tigard, Ore. The title is his first nonfiction book in 12 years, since Tuesdays with Morrie was published. Today on the Martha Stewart Show: Allison Hooper, co-founder of Vermont Butter & Cheese Co. and author of In a Cheesemaker's Kitchen (Countryman Press, $19.95, 9780615262055/0615262058). Tomorrow on Tavis Smiley: Mitch Albom, author of Have a Little Faith: A True Story (Hyperion, $23.99, 9780786868728/0786868724). Tomorrow on the View: Guy Fieri, author of More Diners, Drive-ins and Dives: A Drop-Top Culinary Cruise Through America's Finest and Funkiest Joints (Morrow, $19.99, 9780061894565/0061894567). Tomorrow night on the Late Show with David Letterman: Ralph Stanley, author with Eddie Dean of Man of Constant Sorrow: My Life and Times (Gotham, $27.59, 9781592404254/1592404251). Book TV airs on C-Span 2 from 8 a.m. Saturday to 8 a.m. Monday and focuses on political and historical books as well as the book industry. The following are highlights for this coming weekend. For more information, go to Book TV's website. Gerard Butler has signed to star with Ralph Fiennes in a film adaptation of Shakespeare's Coriolanus, joining a cast that includes William Hurt, Eddie Marsan, Jessica Chastain and Vanessa Redgrave. The film marks the directorial debut for Fiennes and is scheduled to begin shooting in Serbia in March, according to the Hollywood Reporter. The 2009 Prime Minister's Literary Award winners were named by Peter Garrett, Australia's Minister for the Arts. Nam Le won the fiction prize for his short story collection, The Boat, which the judging panel praised for "the daring scope and excellence of its execution, the generous breadth of its emotional and social traverse and the excitement generated by every story." The nonfiction award was shared by two books, House of Exile: The Life and Times of Heinrich Mann and Nelly Kroeger-Mann by Evelyn Juers and Drawing the Global Colour Line by Marilyn Lake and Henry Reynolds. The nonfiction judges lauded both books for "great intellectual authority and international research." Lindy Wiggs is a young girl who lives with her Iraq War vet father in the Oregon forest--they moved off the grid after he took her away from her meth-addicted mother. Jess Villareal is a police officer, divorced and estranged from her young daughter and grandson. She's good at the job she loves, and her work is her life. At the same time, she worries that she paid too much attention to the bad guys and not enough to her daughter, Nina. Their lives intersect when Lindy is spotted in the woods by two bird-watchers, who call the police, thinking she may be lost or abducted. Jess and her colleagues track Lindy and her father, whose emergency escape plan doesn't work this time. "We heard them walking through our camp, remarking on everything we owned like they were in the Columbia Museum of Natural History or something, looking at dioramas of cave dwellers and native tribes.... 'How on earth do they keep everything so clean?' It was like they expected us to be filthy creatures that ate raw squirrel meat or something. I tucked my head down and burrowed into Pater, just to feel his arms protecting me. Please, I prayed, Make these people go away and leave us alone." Of course, they are not left alone, although they are not stereotypically homeless. They go to church, they have a library card, they grow vegetables, they have a treehouse. Lindy says, "My school is books. My school is the forest. My school is Pater." In this situation, follow-the-rules Jess dares to challenge conventional wisdom, possibly at the cost of her job. "The great blue heron stands three to four and a half feet tall and has a wingspan of up to eighty inches wide, wider than I am tall by eighteen inches. I would like to lie in the wings of a great blue heron, in its downy under feathers, and listen to its heartbeat." Shelf Talker: A warm and wise book about a "homeless" family and the dedicated policewoman who aids them, and finds herself in the process. The following is a proposal made by Jack McKeown, former president and CEO of the Perseus Books Group and former president and publisher of the Adult Trade Group at HarperCollins. Currently he is director of business development for Verso Digital, the first vertical ad network for book publishers, and is president of Conemarra Partners, a media consultancy. Last week brought the depressing news that Seattle's Elliott Bay bookstore is in financial distress and may be forced to relocate from its Pioneer Square home of the last 36 years. Facing an expiring lease and a maxed-out credit line, owner Peter Aaron said, "Finding a lender to keep us liquid is an ongoing battle." This has become an all-too-familiar story, of course. Securing adequate investment and working capital, never an easy task for independent bookstores, has been elevated to crisis proportions by the current recession. Is there a solution--one that could help independent bookstores maintain their local competitive advantage and even promote their expansion for years to come? From my many years as a publishing executive, I always have believed that turbulent times in our industry foster opportunity as well as dislocation. The concept that I am floating is not especially complicated, but it does require a leap of imagination and strong leadership at the national level. A thriving neighborhood bookstore is recognized as a key element in the social, cultural and economic fabric of any community. This is an opinion widely shared by urban planners, government planning boards, Smart Growth advocates and real-estate developers around the country. They will tell you that a bookstore offers a tremendous public amenity that should be built into the master plan of any new development or neighborhood revitalization. Primarily it has been the national chains that have been the beneficiaries of this perception, and their superior access to capital is a fundamental reason why. But with the recession, chain-store expansion has ground to a halt and a period of contraction almost certainly will follow. (Barnes & Noble COO Mitch Klipper confirmed as much in an investor presentation last week.) This is part of a larger, radical reshaping of America's retail landscape. More than 400 of the 2,000 largest U.S. malls have closed in the past two years and data suggest that at least another 1,000 are in distress. This represents an acceleration of a trend already underway before the recession took root. Main Street retail was decimated when the malls exploded decades ago, but may well rebound with a tidal wave of mall closures. "One of the biggest consequences of mall closings is the loss of a sense of community, a place where people gather and socialize," said David Birnbey of the Shopping Center Group, as quoted in "The Vanishing Shopping Mall." Can independent bookstores be positioned to help fill the vacuum as commercial real estate markets begin their gradual recovery? Essentially, my concept advances a sustainability and neighborhood redevelopment argument, with the independent bookstore at its center. I would like to propose the creation of a Neighborhood Bookstore Development Bank (NBDB). It is inspired by such special-purpose investment vehicles as the Fresh Food Financing Initiative (FFFI)--a successful five-year-old loan program for independent, neighborhood grocery stores. It also incorporates some of the mechanisms behind the proposed National Infrastructure Bank, as described by Felix Rohatyn and Everett Ehrlich in their October 2008 article for the New York Review of Books ("A New Bank to Save Our Infrastructure"). The NBDB would be structured as a private investment bank, i.e., as an entity that evaluates project proposals and assembles a portfolio of investments to fund them. It would look to a prominent trade organization, such as the American Booksellers Association, to provide leadership in the form of a mission charter and board memberships, but otherwise would operate at arms-length. At the heart of the concept is a NBDB Commission, a committee of experts who would evaluate proposals to provide loans to existing or start-up bookstores on a case-by-case basis. The ABA would assist individual bookstores in assembling their business plans, but the bank's Commission would operate independently and with the highest transparency, in order to attract capital and maintain the bank on a sound economic foundation. A recommended balance of investments between existing and new stores would be 60/40--a conservative approach meant to mitigate some of the risk of a portfolio too heavily weighted toward start-ups. The NBDB would be capitalized through an initial round of paid-in equity and then leveraged at a suggested conservative ratio of 3:1. So, for instance, $2.5 million in minimum seed capital would be leveraged to $10 million at the outset. The pool of initial investors could include the ABA itself, along with such interested players as the national wholesalers (e.g., Ingram and Baker & Taylor). These parties would stand to earn meaningful annual dividends as well as long-term appreciation on their investments. All the while they would be supporting the growth of a core customer segment. Additional seed capital could be secured from REITs (Real Estate Investment Trusts) and private equity companies, perhaps as part of larger real-estate development financings. Capital would be callable beyond the seed round, with the ultimate objective of achieving a ratio of $10 million: $40 million by year three. These sums may strike some observers as modest indeed, but their impact on creating a base of larger and healthier independent bookstores would be dramatic, considering the under-capitalized state of the business now. Ultimately the bank's loans would be packaged and sold in the secondary capital markets, timed to take advantage of the recovery. The NBDB also would tap into the federal government's interest in stimulating capital investment in local, community-based development projects and in promoting sustainability. Government grants and guarantees could be part of the solution to jump-start the effort, as has been the case with the FFFI. In addition, the NBDB could provide an engine for private-public partnerships at the local level, including community-owned bookstore retail via chartered stock companies. In conclusion, the NBDB could play a major role in changing the narrative on independent bookstores from one of decline to rebound. For an industry preoccupied with the discussion surrounding e-books and e-readers, it may seem like a counterintuitive strategy. But that could well prove its strength. It would play into larger demographic patterns, such as the imminent retirement of 78 million baby boomers, the urban migration of younger age groups and the contraction of America's malls. These trends point to the development of better bricks-and-mortar, neighborhood-centered retail. With adequate capital at their disposal, and equipped with strong business plans that meet the NBDB's test, independent booksellers could reposition themselves for a brighter future.